“The “Akanishtha of Power and Richness” [dbang phyug chen po’i ’og min], often referred to as “Great Akanishtha” [’og min chen po] in the teachings. This is the very place where sambhogakaya emanations arise from the dharmakaya. However, it is not just sambhogakaya emanations that emerge in the Akanishtha of Power and Richness—nirmanakaya emanations also arise here before they manifest in various realms. The great Indian master Nyi Od Senge taught that Buddha Shakyamuni actually achieved enlightenment in Akanishtha. From there, he emanated in this world as a nirmanakaya. In other words, Nyi Od Senge explained that the Blessed One became enlightened in the Akanishtha of Power and Richness, but the active state of his compassion and loving-kindness took the form of a body, thereby emanating in this world as the nirmanakaya Buddha Shakyamuni. 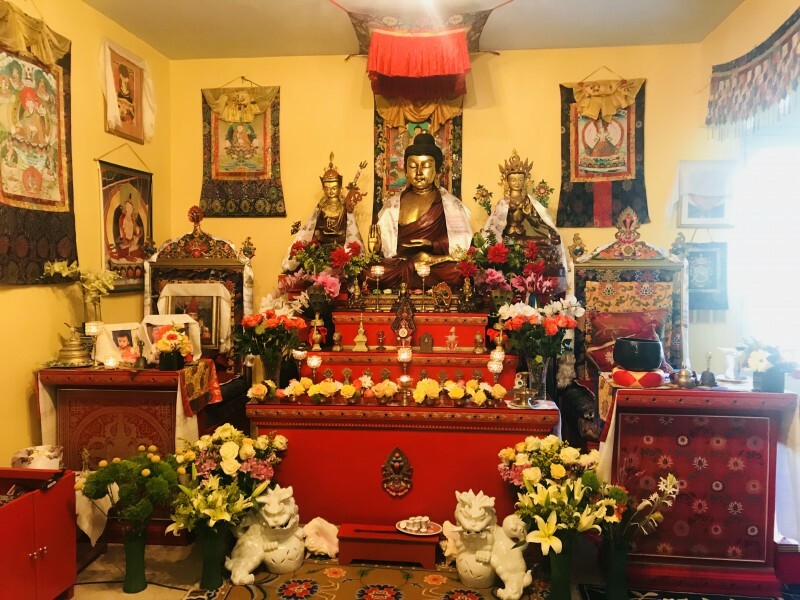 Photo of the shrine at PBC Pema Tsokye Dorje Ling Temple in Puerto Rico.